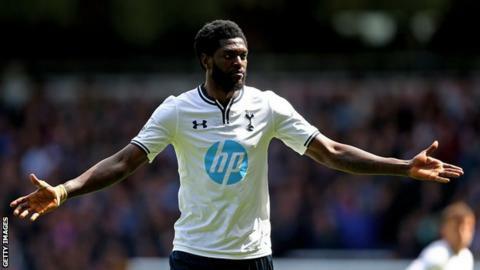 Togo have recalled Emmanuel Adebayor in the hope that the striker will return to the international fold after an 18-month absence. The Tottenham Hotspur striker, 30, refused call-ups for World Cup qualifiers last year following a spat with then coach Didier Six after the 2013 Africa Cup of Nations. In June, the Frenchman was replaced by his former assistant Tchakala Tchanile. Togo play Guinea in Group E on Friday, before facing Ghana on 10 September. It is unclear whether Adebayor will honour his selection, with the former Real Madrid and Arsenal player having ignored call-ups in recent times. He was critical of Six even though the coach made history when leading Togo to their first Nations Cup quarter-finals in South Africa last year. Next week's match is technically a home fixture for Guinea but the game will be played in the neutral venue of Morocco because of the outbreak of the deadly Ebola virus in Guinea. Adebayor quit international football after the terror attack on the Togo team during the 2010 Nations Cup but came back after an appeal from the country's head of state.